What are whiteflies? First, they are not flies or related to flies. White Flies are small, winged insects. These insects typically feed on the underside of leaves with their “needle-like” mouthparts. Whiteflies can seriously injure host plants by sucking nutrients from the plant causing wilting, yellowing, stunting, leaf drop, or even death. There are two types of White Flies, the Fig (ficus white fly) and the Rugose Spiraling White Fly. 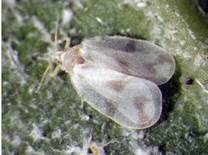 The Rugose Spiraling whitefly appears to have a very broad host range from palms to woody ornamentals and fruits. The adult Rugose Spiraling Whitefly congregates on the undersides of the leaves to feed and reproduce. The female Rugose Spiraling Whitefly lays her eggs in a spiral pattern on the leaves and also deposits a white, waxy substance on the eggs. The crawler stage hatches from the eggs and crawls around before it starts to feed with its “needle-like” mouthparts. This stage is very small and difficult to see. The most noticeable symptoms of an infestation of the Rugose Spiraling whitefly are the abundance of the white, waxy material covering the leaves and also excessive sooty mold. The actual effect of an infestation on the health of a plant is unknown; however, Rugose Spiraling whiteflies in general can cause plant decline, defoliation and branch dieback. The life cycle of the Fig ficus whitefly is approximately one month. Eggs, which are usually laid on the underside of leaves, hatch into a crawler stage. The leaves of ficus trees infested with whiteflies begin to turn yellow before the leaves are dropped from the plant. Defoliation is one of the most obvious symptoms of an infestation of ficus whitefly. However, if you have defoliation, you have had the whitefly for numerous months. In addition to defoliation, there can be branch dieback. The amount of branch dieback is highly variable and is probably linked with the overall health of the plant. In most cases, trees and hedges will grow new leaves. Dead branches need to be pruned out. Monitor your plants for early signs of a White Fly infestation because it will be easier to manage the pest before it builds to high populations and causes major damage. Remember, if you have defoliation, the whitefly has already gone through several generations (several months). If you have an infestation on a trees or hedges, be sure to search nearby trees, hedges, and plants as well because this whiteflies feeds on many types of trees, hedges, and plants. If the infestation is large, an insecticide may be needed to control the whitefly population. There are several insecticide options. A systemic insecticide can be applied directly to the infested plant or to the soil. Contact insecticides are typically sprayed on the foliage or other infested parts of the plant or in the soil for soil-dwelling insects. , If you trim/prune infested plants, be sure to remove the clippings from your property to reduce the chance of spreading the insects. Note that the later stages of the whitefly on fallen leaves can survive and emerge into an adult and attack more plants. The white, waxy material and the sooty mold on the plant from the Rugose Spiraling White Fly will take time to wear off, after treatment, unless physically washed off. If you are in an infested area and have susceptible trees, hedges, and plants you may initially need to use an insecticide to control this pest. It is extremely important to use the appropriate insecticides. 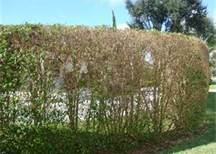 There have been reports of this whitefly killing ficus trees and hedges. There have been cases of branch dieback which sometimes can be severe and in a few cases plant death. In most cases, the trees and hedges will grow new leaves. If the tree or hedge has suffered from a massive loss of leaves, it is important not to overwater. Without leaves, the plants are less efficient at taking in the water and start to rot in the roots or lower trunk which may lead to plant death. If the twigs are still supple, the plant will produce new leaves in a few weeks. As soon as new growth is evident, a systemic insecticide applied to the soil may provide protection to the new growth. White Flies can be controlled for long periods of time with Systemic formulation insecticides. This type of insecticides will be absorbed into the plant within a short period of time through soil injection, drilling, or soil drenching. Then will protect the plant from 6 months to a year from future White Fly infestations. Both types of White Flies infest large areas and complete neighborhoods. After you plants have been treated, your plants are now protected. But, the neighborhood will still be infested. Just as you apply insect repellant to yourself to keep mosquitoes from biting you, there are still mosquitoes near and around you. It just keeps the mosquitoes off of you. Many of you have pets. You apply a flea and tick insecticide on your pet to keep the fleas and ticks off of them. That does not eliminate the fleas and ticks in your yard. It just keeps the fleas and ticks off your pet. This applies to the White Fly treatments also. When you have your trees, hedges, and plants treated for White Flies, the plants are protected from White Flies. That does not mean the White Flies are not in your neighborhood and still could be seen on or around our plants. Once your plants have been damaged from a White Fly infestation, the existing damage cannot be repaired. The new growth from the plant will be protected with the White Fly treatment. It depends on the type of plant and the time of the year how fast the new growth will appear. But, when the new growth appears, inspect it for damage. It should be healthily without damage, because the plant has been protected with the White Fly treatment. If you live in Naples, Bonita Springs, Fort Myers, or anywhere in Southwest Florida and need your trees, hedges, and plants protected from damaging White Flies. Call, 239-455-4300, Collier Pest Control for a complete explanation on either of our White Fly treatments or look us up on our website at collierpestcontrol.com. Remember Florida does not have to be shared with insects.